Our primary goal is to be an example of efficiency and conservation while catering to all of the needs of residents. By tackling every aspect of water use in Fordhamopolis, from private to agricultural, we have devised a multifaceted plan to obtain, distribute, and reuse water. Fordhamopolis will use new innovations that combine the newest technologies available with artificial intelligence and biomimicry to implement sustainable and hyper-efficient desalination, geothermal climate control, wastewater treatment, rainwater collection and agricultural irrigation systems. These sections rely on one another to create a virtually closed circuit for water throughout the Fordhamopolis system under the monitoring and optimization of A.I..
We will model our desalination plant off the Sorek plant near Israel, which utilizes reverse osmosis to efficiently convert saltwater into freshwater. In order to maintain sustainable amounts of domestic water consumption, Fordhamopolis will feature innovative engineering methods to minimize water use per capita, accompanied by the encouragement of important behavioral changes. The treatment of wastewater in Fordhamopolis will integrate the most innovative and efficient water treatment methods available in order to repurpose used water in a cyclical pattern. This method will not only minimize the input of new desalinated water needed, but will also tap into the energy resource potential of wastewater. With the combination of resource collection and photovoltaic windows, the treatment plant will likely generate more energy than it needs to operate and will be able to contribute power to the underground transportation systems. 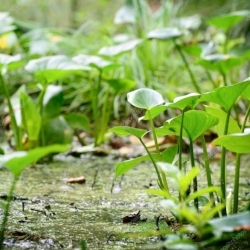 The foundational processes used in the water treatment systems, such as sedimentation, UV sterilization, and the anaerobic digestion, and hydrolysis, mimic the natural processes of water purification in wetlands. The treatment plant will use biological hydrolysis to convert sludge into energy in the form of biogas. A series of innovative filtrations and chemical disinfectant alternatives newly developed by researchers will be added to the modern method of activated sludge treatment (right) and remaining sludge will be sent to waste management for gasification. This will serve to enhance the efficiency and effectiveness of filtration since the discharged water will be used for irrigation of non-produce plants. A separate but similar treatment and purification system will be used to reycle greywater for household and industrial purposes, although industries will be run with minimal water and sustainable technologies like the Adidas DryDye for textiles. Geothermal energy is inexhaustible and the soil temperature in Cyprus is ideal for this system. In addition to the passive ventilation and heat exchange technologies used, all buildings will be equiped with geothermal systems that harness the Earth's soil temperature to heat and cool water, which then flows through building walls and floors for temperature control. Drinking water will be obtained using rainwater collection and purification. Initial filtration of rainwater through the greenroofs will be followed by a thorough purification process to ensure the highest quality drinking water. After activated carbon and sedimentation filtration, rainwater will be run through a UV sterilization and a biocide disinfectant filter. Initially filled with desalinated water, the vertical farms will be irrigated in a virtually closed loop with minimal water loss. Irrigation water, once evapotranspired by the plants, will be condensed, replenished with nutrients via an aquaponics system, and reused (see Food section).